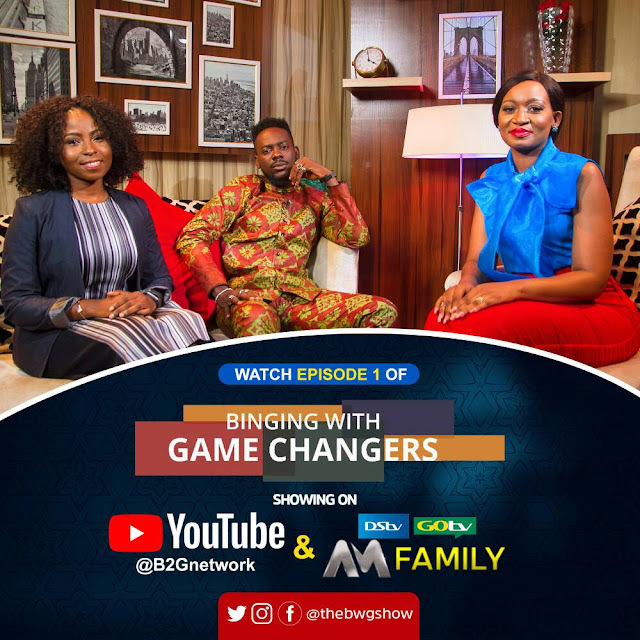 The first episode of Binging with Gamechangers is finally here; a talkshow hosted by Seyi Banigbe, a corporate/commercial lawyer and serial entrepreneur whose bubbly personality makes the show fun and insightful. The show delves into the thoughts and perspectives of the people behind some of Nigeria's most successful brands, as well as individuals thriving in their chosen careers. It will provide viewers with nuggets that would enable them thrive in their various fields. This week we begin with Singer/Songwriter, Adekunle Gold as the Celebrity GameChanger and Partner at PricewaterHouseCoppers, Esiri Agbeyi, as the Corporate GameChanger. On Episode 1 of Binging with GameChangers, Adekunle Gold walks us through his journey of hardwork, rejection, persistence and successes in the music industry. Esiri Agbeyi takes us through her journey from cake-seller to becoming the first female partner in the tax unit of PwC Nigeria, at unimaginable speed. The first part features the interview with Adekunle Gold while the second part features the interview with Esiri as well as a game between the both of them (guess who won, the musicians or the corporates!). New episodes of Binging with GameChangers will be released every Friday on YouTube and every Sunday on Africa Magic Family channel 154 at 6.30pm. Watch the episode below. Enjoy!